We get up early, and are picked up and driven to the border. The Jordanian side is efficient and we are soon walking the lonely road of “no man’s land” between the two border stations. It always feels as though you are in a cold war movie. We get stuck behind a Russian group on the Israeli side, and so it is slow going, and the man who is to drive us to the airport doesn’t show up, so we have to call their office. Finally a substitute arrives and we check in at the airport. Remember the questions we used to be asked at airports (who packed your bags, did anyone give you anything, where are you going, and what are you going to do there)? Well these are still alive and well at Israeli airports. And I experienced a totally different one at Eilat. 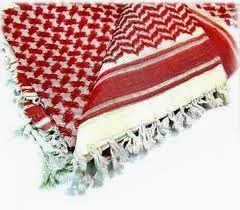 “Did you buy anything in Jordan?” “Yes, a keffiyeh – a Jordanian headdress?” “What are you going to do with it?” “Use it as a scarf.” “Are you going to pray with it?” (silence) “They pray with them, you know. (Arthur) “He’s an Anglican priest, they don’t do that! The trip is accomplished in a turboprop – it’s been a while since I have traveled in one. We sweep over the Negev and there’s not much to see other than the desolation that gave birth to splendid spiritual ideas. It’s hard to pick out landmarks, and even more difficult to get one’s bearings. 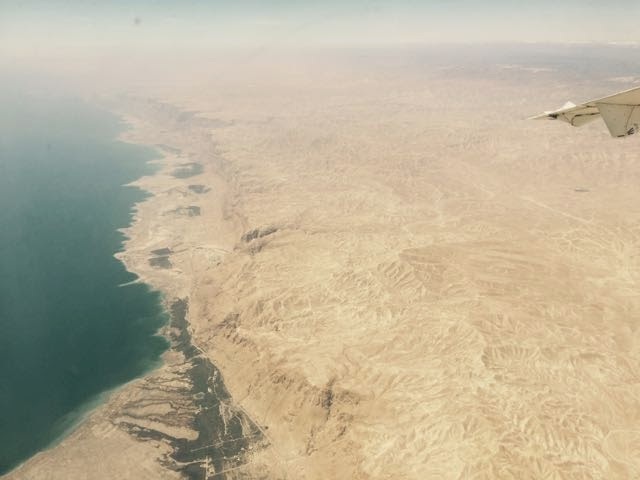 Finally, well into the flight, and almost at its end, I see in the rear view of my window the Dead Sea. It too contributed to our spiritual and theological tradition. I wish we had the time to go there. We arrive at Sde Dov and grab a cab to Ben Gurion, where we will have to await the arrival of other delegates to the conference in Jerusalem. We have lunch and I write my lectionary blog for a later posting. Soon the others begin to arrive – first from Australia, and then the US and Britain. Some people I know, but most are new – a lovely lot. Soon we’re on the bus on our way to Jerusalem. 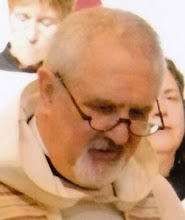 I have not been here for forty years, so the change is astounding to me. It seems to me to be one of the most densely populated areas I’ve seen. 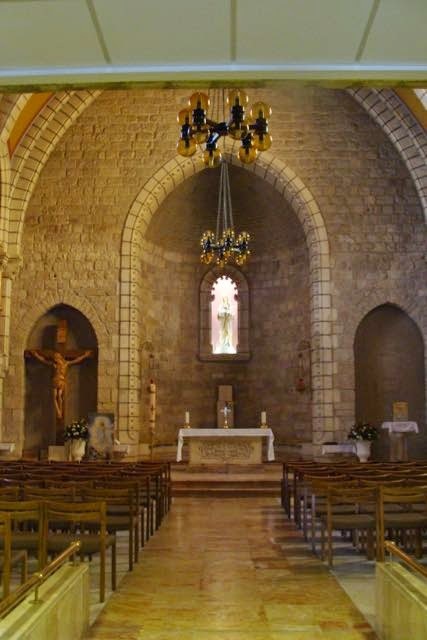 Soon we’re at the Pontifical Institute of Notre Dame, just outside the city walls and close to the Church of the Holy Sepulcher. It’s a lovely building and is quite active with pilgrims. Our room is nice, but small. Most of all it is quiet. There’s dinner, a brief meeting, and then Compline. After all the transit that the day offered, I’m quite tired and we’re off to bed. 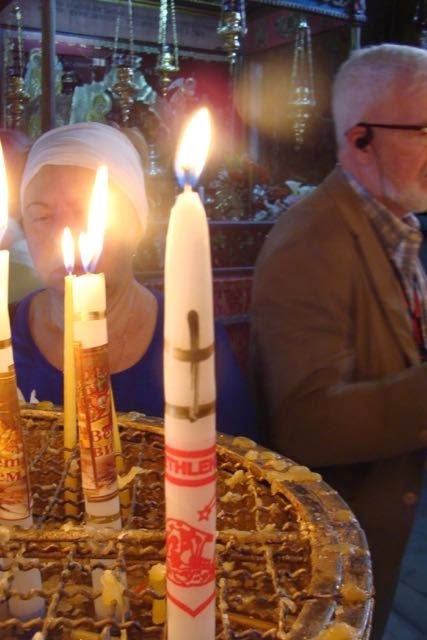 The next day is devoted to Bethlehem, and we are saying Morning Prayer on the bus. Outside there are images that are in distinct conflict with the words of the Magnificat or the Our Father. 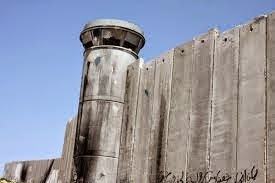 To get to Bethlehem, in other words, into Palestine, we have to pass the hideous wall that Israel is hiding behind. It sets a tone of separation and conflict. We first visit the chapel at the so-called “Shepherds’ Field” with its chapel and grotto. 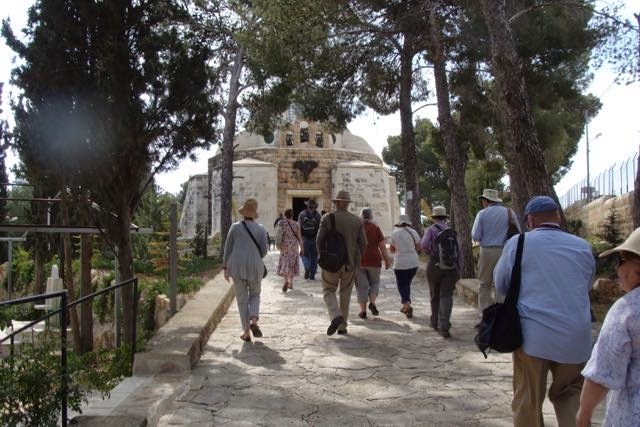 Mass is said in the grotto, and we look at the grounds, including the excavation of a Byzantine church. As I look across the valley I am stunned by what has happened. When I was first here, the scene was very much like the one at the head of this blog entry – fields and olive trees. Now it looks like this. 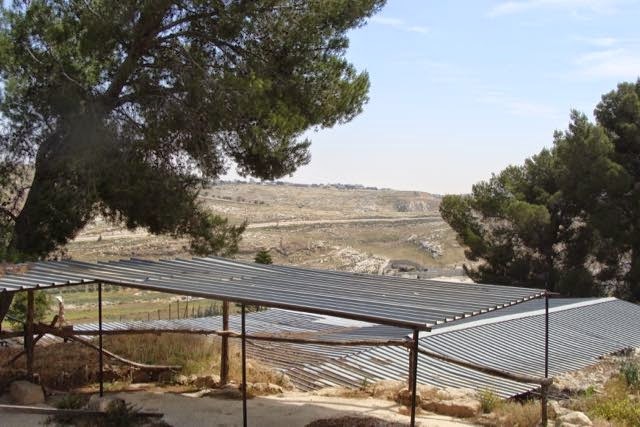 Thousands of Israeli settlements sitting on Palestinian lands are a sign of the deep separation in this land. In Tel Aviv we witnessed at least one peace rally, where Israeli demonstrate against the accesses of the government’s Palestinian policy. Next is the obligatory visit to a shop. We don’t buy anything. Then there’s lunch – it’s good. A selection of mezes, skewered lamb, chicken, and tomatoes with French fries! Satisfying though. 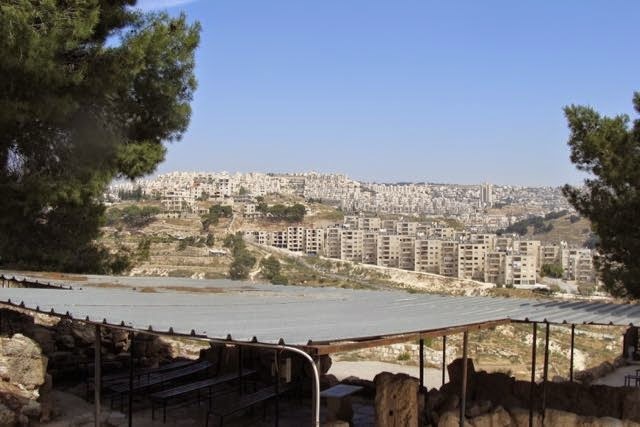 Next is the Church of the Nativity undergoing heavy restoration sponsored by a Palestinian Presidential Commission. It is not as crowded as I feared, and we gain quick access to the grotto. 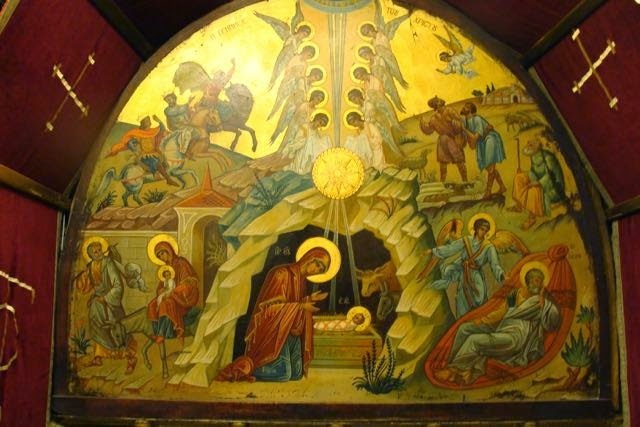 I am amazed by my emotional reaction – being near to tears, as I kiss the silver star that mark’s the place of Christ’s birth, and the manger as well. I wonder what that was all about. We go to Saint Catharine’s next door, which is unremarkable, and then visit St. Jerome’s cave, which I always find quite satisfying. We go back to the Nativity, and I light a candle for Patrick. I sincerely hope that he is getting better. Finally we are back at the hotel, and take a nap, have a wonderful study on the Birth Narratives of Matthew and Luke by the new Rector at Tantur. Then there is dinner and Evening Prayer, along with an extensive discussion of the situation in Palestine. It has been both an exhilarating and troubling day.